"A stunning collection of intimate portraits. If you ever wondered why the world loves this woman, Bozzacchi's book will answer your question." "Brilliant, sensitive, Gianni always catches the soul." 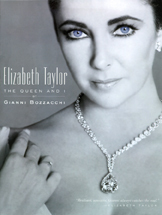 Elizabeth Taylor: The Queen and I is a remarkable collection of photographs Gianni Bozzacchi has taken of Elizabeth Taylor, most of them previously unpublished, capturing her as a film star, a woman, and a personal friend. It was 1965 when Bozzacchi, an impetuous twenty-two-year-old, was given the chance of a lifetime. The streetwise kid from Rome was sent to Africa as special photographer on the set of The Comedians, a movie starring Elizabeth Taylor, Richard Burton, Alec Guinness, and Peter Ustinov. As the film wrapped, Taylor offered Bozzacchi a job as her personal photographer. Elizabeth Taylor was the world's most famous woman at the time and undoubtedly its most glamorous. Her marriage to Richard Burton claimed international attention, and together they were the quintessential jet-set couple. Bozzacchi was to work with Taylor and Burton for the next eleven years. They opened the door to their world for him, and his own talent, drive, and artistic style earned him extraordinary success. Publications wanted his services, as did the movie and fashion industries, celebrities, political figures, and the merely famous. Bozzacchi was awarded the honor of International Photographer of the Year three times and became a celebrity himself, the subject of magazine layouts and television interviews. Gianni Bozzacchi works today as a writer, producer, and director. He has collaborated on feature films with Michelangelo Antonioni, Sergio Leone, Pietro Germi, Vittorio De Sica, Francois Truffaut, Federico Fellini, and Luchino Visconti. Currently, he and Roy Scheider are producing for television The Renaissance, a twenty-four-hour drama and a twenty-hour documentary supported in part by the European Community, S.A.S. Prince Albert of Monaco, and the members of the entertainment community. Gianni Bozzacchi lives in Rome, New York, and Franklin, Wisconsin. For additional information. “I so enjoyed this book by Gianni Bozzacchi about his friend Elizabeth. He thinks she's a blast of fun, and there's a hint of mischief that he sometimes caught that's fresh and spontaneous. In my favorite shot, she runs to camera, her legs bare and strong, strangely revealed, a gleeful, slightly spoiled child-woman. In this collection of photos you feel her private thoughts, her love, her sadness often near the surface, and that survivor spirit, so admirable always in such an exposed and difficult life."